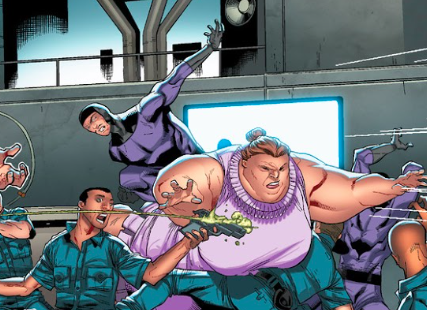 Powers/Abilities: Teena the Fat Lady had no known super powers, though she had battled several super heroes using her strength and size to her advantage. More agile than she seemed, she could used her bulk against opponents and had been known to sit on them. (Official Handbook of the Marvel Universe I#9 (fb) – BTS) – Maynard Tiboldt, the Ringmaster, relocated Tiboldt's Circus to America, where he developed a hypnosis hat and a plot to mesmerize crowds and rob them. He formed many of his performers into the Circus of Crime with the others going back to Europe. It was unrevealed when Teena the Fat Lady joined up with Tiboldt's Circus but she became an original member of his Circus of Crime. 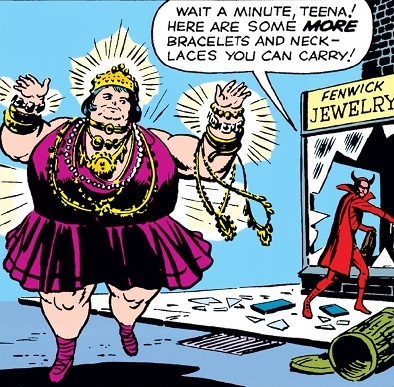 (Incredible Hulk I#3/3) – The Circus of Crime robbed several towns with Teena the Fat Lady gathering as much jewelry as possible in one town. Later, they were defeated when the Hulk and the F.B.I. attacked. (Official Handbook of the Marvel Universe: Deluxe Edition I#2 (fb) – BTS) – Teena briefly left the circus in hopes of marrying and starting a family but she later returned. (Incredible Hulk II#292 (fb) – BTS) – The Circus (Ringmaster, Clown, Fire-Eater, the Great Gambonnos, Human Cannonball, Live Wire, Rajah (aboard his elephant Sultan), Teena the Fat Lady, Bruto the Strong Man and Princess Python (with Precious)) headed to Mexico, fleeing warrants, where Ringmaster forced Dragon Man to perform with them. (Incredible Hulk II#292) – When Teena and the Circus saw the Bruce Banner arrive with his girlfriend Kate Waynesboro, Ringmaster forced Banner to change to Hulk and battle Dragon Man. Before the fight concluded, the Big Top was destroyed. (Amazing Spider-Man III#19.1) – Mr. Negative proposed an alliance with the Circus of Crime (Ringmaster, Great Gambonnos, Teena the Fat Lady, the new Clown, Princess Python, Bruto, Fire-Eater) but the Circus refused. Later, as they battled police, Spider-Man and Wraith intervened, easily defeating the villains. During the fight, Teena threw herself at the cops and battled Wraith. (Captain America: Steve Rogers I#13) – Baron Helmut Zemo approached the Circus (Ringmaster, Great Gambonnos, Fire-Eater, Bruto, Clown, Teena the Fat Lady) for an alliance and they later gathered with a larger army, forming the Army of Evil.